You ever spoken to an actual card sharp? These days you’ll mostly only know that kind of operator as a person who does tricks. Not the people at a bar who knows a trick or two. I mean an honest to god magician, someone who actually knows how to do actual card tricks, the kind of things that you keep well and clear away from card games, because if anyone knows you can do something like that, you destroy the ability of people around you to trust what you’re doing. There is a lot of playing a game with cards that rely on a sort of shared fiction of randomness, and most of the time you’re dealing with random enough. There’s a reason people are prone to blaming ‘the shuffler’ on MTGO – quite a lot of people aren’t used to actual randomness, stochastic patterns of what can actually happen when you let a machine run the math that your wobbly human hands of meat and bone can’t quite get done elegantly. And what damages that even more is learning just how much control someone else can have over a shuffle. Thanks to my odd backgrounds, there’s a part of my life where I did learn The Olde School of Magicke And Illusion. Not cool stuff with pendants, witches and fishnet tights. I mean the stuff with top hats and coloured wands and fishnet tights. Part of this skill set was a lot of is thiiiis your card nonsense. I was not great at it, and having my cards confiscated multiple times for potential demonic summoning was kind of a damper on practicing. Also, nobody cared to watch as I learned and practiced. But you know one skill that’s really important to that skillset that never goes away once you learn it? This here is a Double Undercut. It looks like a reasonably natural shuffle. The top card of that deck is the Jack of Hearts, the card cut into the centre. This is not only doable, but this is doable with other shuffling forms. You can make more loops, put the card from the middle to the bottom to the top to the bottom to the top again, over and over again, with a great deal of confidence. You can do this with a riffle shuffle if you know how to reverse a deck. It’s really not hard once you know the techniques, the rest is just practice. I make a big show of how I shuffle. People tend to be impressed with how I do it, because I riffle shuffle, and I do it faster than they do. I don’t tend to lecture people or show off how to do trick shuffles, because I don’t want people thinking I’m going to do it. It’s important to me to play fair, and to always play fair, and even if I’m not cheating, knowing that I can cheat – in a way other people can’t – is really distressing. And that’s legitimtae! That’s a really real concern! There’s another type of player who don’t like seeing you know how to cheat, and that is cheaters. I chatted with a card sharp this weekend, at a convention. I appreciated their skill, and we talked a little. I was selling card games, he was getting paid to show off his card skills, and it was a fun little conversation. One thing we both agreed on, though, was how many people who play cards leave themselves wide open to be cheated. 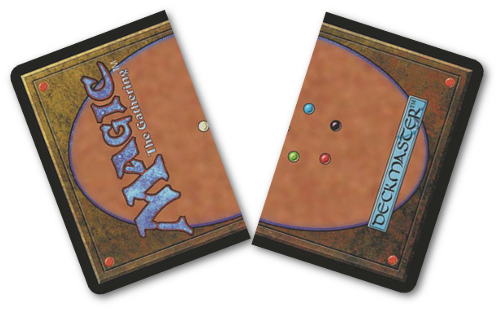 You probably already know some basic tricks to protect yourself from cheating in Magic: The Gathering. Cut your opponents’ deck, every time. When you shuffle, offer your deck to be cut, every time. When they shuffle, and don’t offer to cut, interrupt them, explain what you want to do, and do it, every time, even if it annoys them. The important thing is you make this a rule. You always do it. If you always do it, even this very modest anti-cheating measure, you remove the ability for anyone to feel singled out. People can’t complain that you’re showing them a lack of distrust. You set up these gates, and you make it a rule, not because everyone cheats. Barely anyone cheats. Almost nobody cheats. But when you do this, you make it clear to the players who do cheat, who can cheat, that you’re not going to give them the easy ones. You’re going to discourage them from trying. Are you going to catch everyone with this mindset? No, not at all. Should you do it anyway? Yes. You should do it, and you should do it with your friends for the same reason you should get vaccines. It’s there to protect you and your friends, it’s about the people who make it necessary. And if you’re a streamer or playing in public with your friends? You should do it then, too – because you’re trying to spread the idea that this is a thing you should always do. Work Process – Boat Game!